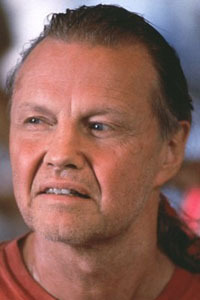 Jon Voight was a big movie star in the late 1960s and 1970s. Early in his career, he did guest shots on 1960s TV shows like Naked City, Gunsmoke, and Twelve O'Clock High. He played the 17-going-on-18-year-old Nazi in Broadway's Sound of Music, and married and divorced the actress who played Leisl. With his pretty boy baby face, Voight was perfect as the hick-turned-gigolo in the X-rated Midnight Cowboy (1969), for which he was nominated for an Oscar. He also starred in Catch 22 (1970), Deliverance (1972), The Odessa File (1978), and The Champ (1979). His most famous work is Coming Home, the 1978 Vietnam aftermath movie which won him his Oscar. Voight's best flick might be Conrack, Pat Conroy's true tale of teaching black children in South Carolina amid stark poverty and indifference. Now mostly a charactor actor, Voight's celebrity has been eclipsed by that of his daughter, Angelina Jolie. After a decade of estrangement, father and daughter reconciled in the late 2000s. Voight's brother James wrote the pop hits "Wild Thing" and "Angel of the Morning", under the pen name Chip Taylor.